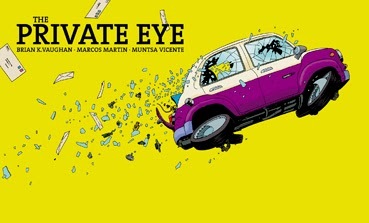 That bit of hyperbole is what I tweeted to my Comics Illuminati brothers after I had read Brian K. Vaughan & Marcos Martin The Private Eye #1, a surprise, bold new digital-only comic featured on their Panel Syndicate website (with impressive color work by Munsta Vicente). In an unprecedented move from established comic book creators, this new digital comic was offered with a “pay what ya want” option. I paid $2.99 for it because that’s what I paid for issues of Mr. Vaughan’s other comic (which I’ll talk about later). The comic was brought to my attention by Warren Ellis via his website, where he noted that Vaughan and Martin suggested $0.99. I still don’t feel like I overpaid (and given that it’s digital, that’s saying a lot). At any rate, despite my preference for physical versions of my comics, this is a highly enjoyable science fiction series about a private detective uncovering mysteries in a future where identity and privacy don’t mean quite what they used to mean. That severely mucks things up for our erstwhile detective hero. The series is thrilling, insightful, alarming, and socially relevant to things that may someday doom us as a society, if they’re not already starting to (this is not much unlike what Ellis’ Transmetropolitan did for us a decade and a half ago). It should also be noted that the comic’s presentation is flawless, giving its landscape orientation, making it formatted the way digital comics should be to fit perfectly on various tablets, executed with seamless page transition. The Private Eye is projected to be about 10 issues. It’s been successful enough that the creators will certainly reach that goal now. Afterward, one can only hope they team up for yet another ground-breaker.